Many moons ago on a Turkish boat I tried something which I was told was like yogurt. It was kefir and I thought it was vile. All these years later I have come across kefir in a completely different way. You may have heard Shann Jones on BBC Radio 2’s Steve Wright Show. 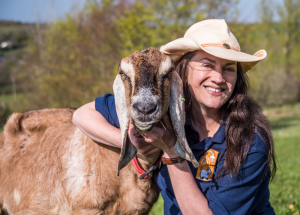 She is American, married to a Welsh farmer, and because her son had eczema they decided to get a goat and ensure that he had goat’s milk products instead of cow’s milk which can exacerbate the condition. Out of the goat’s milk Shann decided to make soap and skin cream which cleared her son’s eczema. They also found out how to make the live culture kefir which is quite prevalent in Eastern Europe. It is a natural probiotic which has very strong powers to heal the gut and repopulate it with healthy bacteria. It still tastes vile but it’s incredibly effective. Rich, Shann’s husband, went into hospital for a major operation and when he returned home he had a large incision that was infected with MRSA. Shann used essential oils and Manuka honey on the wound and completely cleared the infection. Now they have 55 goats and a thriving online business where you can buy a 21 day supply of Kefir, special soaps containing essential oils and a kefir cream to put on the skin. And they have lots of success stories, some of which will appear on this website soon. It’s not just skin conditions that can be helped. As so many health issues come from an unhealthy gut, people have found that it can be helpful for psoriasis, acne, eczema, IBS, and osteoarthritis, etc. Shann says of eczema, ‘Steroid creams alone never resolve the problem, because it’s not a skin condition, it’s a gut disorder.’ She has had many people writing in with photos – like these ones here of eczema that has healed after a course of kefir. Research is currently going on into the healing powers of kefir. When you put something on your face, you want to feel confident that it’s not going to cause harm and give you skin problems. However, harsh chemicals in cosmetics are causing a huge rise in skin allergies, as highlighted last year by the BBC programme Watchdog. Other problems with cosmetics have been exposed too – tiny plastic microbeads are added to facial and body scrubs, toothpastes, and shower gels instead of natural alternatives. These microbeads are ending up in the seas and getting into the food chain through fish, so not only are they going on our skin, we’re eating them too. To be fair after the Independent on Sunday highlighted this problem they have had assurances from leading companies including Unilever, Proctor & Gamble, Boots, Marks & Spencer, Johnson & Johnson, L’Oréal, Estée Lauder, Reckitt Benckiser, Clarins, Sainsbury’s, Tesco, Superdrug, that they will phase them out. Dr Ian White, a leading dermatologist at St Thomas’ Hospital, London, was reported as saying that more and more of us are suffering from skin allergies, including eczema, and that two chemicals used in cosmetics and toiletries as preservatives are being linked to increased numbers of people suffering from eczema. The chemicals are methychloroisothiazolinone and methylisothiazolinone (often referred to as MI). The answer is to go for genuinely natural skin care products, and that means reading labels very carefully or going to shops and websites who only sell certified natural skin care. To add to the problem many toiletries are labelled ‘organic’ when only 5 to 20 per cent of their ingredients are actually organic. 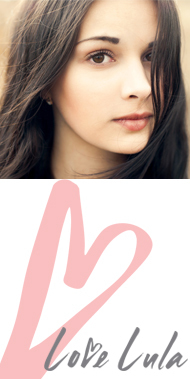 We recommend going to LoveLula who only sell truly natural cosmetics and make up. Try Love Lula. For information about The Good Scrub Guide visit www.fauna-flora.org and to find out more about Botanical Brands Limited go to www.botanicalbrands.com. How many people do you know who have hay fever, eczema, asthma or who can’t eat certain foods? It is claimed that one third of the British population – around 20 million people – suffer from an allergy. There are only 33 NHS allergy specialists in the UK and waiting lists run up to nine months. Many people are frustrated by the lack of knowledge GPs have and may find it difficult to be referred to a special allergy clinic as there are around 12 full time clinics in the whole country and about the same part-time, whereas there should be one at every hospital. Christine Boothman woke every morning at 2 a.m with a terrible headache which lasted until 11 o’clock each morning. By this time she felt incredibly tired which was made especially difficult as she works as a nursery nurse with noisy children. The doctor couldn’t find anything wrong with her, but when she went to YorkTest and had a food intolerance test she found she was intolerant to beef, eggs, dairy and wheat. She cut them in October 2007 and hasn’t had a headache since. Natalie Tadman, 32, is an art teacher who has had eczema since she was a child when she had patches on her face and hands. Whatever treatment she was given did not help but after taking a food intolerance test she found that she needed to cut out bread, dates and wine. She is now in control of her eczema more than she has ever been. Go to our Therapies A-Z page to find out more. The Allergy Bible by Linda Gamlin. Click on the Amazon ad. Feeling stressed? The book for you. Disclaimer: This site does not replace medical advice and accepts no responsibility for any of the therapies and remedies which have been described. If in doubt about a medical condition consult your GP.